Content Marketing 101 | Jody Nimetz Co.
You know those of us in marketing tend to throw around a lot of buzzwords and marketing jargon. Digital marketers are not unlike traditional marketers with their jargon and terminology. SEO, SEM, PPC, Remarketing, rich snippets, organic campaigns and the list goes on. Even when it comes to Content Marketing, there are a wide array of definitions out there. Content marketing is a strategic marketing approach focused on creating and distributing valuable, relevant, and consistent content in a digital manner to attract and retain a clearly-defined audience — and, ultimately, to drive profitable customer action. It is simply using digital or mobile as your channel for your content marketing efforts. For reference, here are some other definitions from industry folks. Check out our post on Types of Content that can be leveraged as part of your content marketing efforts. It has been amazing to see the move to the Digital Age. There have been notable industries that have struggled to become digital. Newspapers and Yellow Pages come to mind. The Digital Age has had a dramatic impact on the print business. How many of you use a hard copy of the phonebook or read a physical, hard copy of a newspaper on a daily basis? The move to digital and mobile has given the consumer the option of having the World’s information at their fingertips. Consumers have shut off the traditional world of marketing. I have often said that the PVR is one of the greatest things of all time because I can fast forward commercials. In today’s age, consumers own a PVR or DVR and can skip television advertising, and now have become so adept at online “surfing” that they can take in online information without a care for advertisements, banners or buttons making them somewhat irrelevant. Even in the digital space, users often ignore paid ads in the search results opting instead to click on an organic or natural search listing. In fact I was part of some original research at Enquiro that suggested that organic results are clicked on 80%+ of the time. Our original research in 2003 still holds up today, although Google continues to make their search results more dynamic in an effort to serve up relevant content faster and easier to the user. This is why you need to be doing content marketing. The purpose of content marketing is many but at the heart of it, content marketing is used to attract, educate and retain customers by consistently creating and publishing relevant and valuable content with the intention of enticing, changing or enhancing consumer behavior. It (content marketing) is an ongoing process that is most efficient when it is integrated into your overall marketing strategy. It differs from traditional marketing in one main area. Content marketing focuses on owning media, and not just renting it. The thing is that anyone can become a publisher these days. As a result, the challenge becomes creating content that is fresh, useful and relevant to your audience in the right form, in the right place at the right time. Awareness –Prior to awareness a customer may have a need, but they are not aware there is a solution. Content Marketing can be used to intercept potential customers by creating an awareness of your brand, your products or your services. This is where semantic relevancy comes in. Your content must speak the language of your audience and not necessary that of your industry jargon. Research –Once a customer is aware there is a solution for their issue, they will perform research to educate themselves. Leveraging content marketing as part of your SEO efforts can ensure that when people search for information on Google, on Facebook other channels that your business shows up and will be included as part of the consideration set. For example, a person interested in buying an electric car will try to find out what their options are, which option will fit their needs and which ones they can afford. Consideration –At this point the customer starts comparing different products from different vendors to make sure they’re getting a high quality product at a fair price. Effective content marketing efforts can help ensure that your business is one of the rungs on the ladder as part of their consideration set. Buy –Ultimately you want the customer to follow through with some form of action such as completing a purchase. Your content marketing efforts can directly impact the customer’s decision as they move closer towards the transaction. 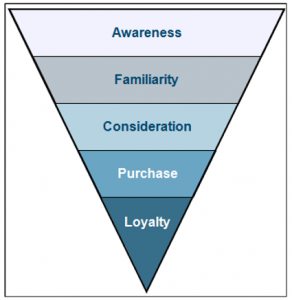 Loyalty – In the digital marketing age, the buying funnel does not stop with completed purchase. The consumer is educated, they know their options. You want to leverage content marketing to help your customers evangelize your products, services and your brand. You want them to share information and their experience. You want review and testimonials (especially positive ones). You can use content marketing to create loyal customers even in the most competitive markets. There are a number of goals that can be measured as part of your content marketing efforts. Here are ten content marketing goals that you may want to consider as part of monitoring the impact of your content marketing efforts. Of course there are more goals as well as specific KPIs (Key Performance Indicators) that can be used to measure your content marketing efforts. The Content Marketing Institute has a great infographic that illustrates how you can use content marketing to “score” with your audience. If you are looking for a Content Audit for your website, contact us for a free quote on a Content Audit. While there is a ton of information that has been written on the topic of content marketing, here are some great resources that I would recommend you check out when you get a moment.